Some people never take any notice of their shower curtain rod, but they certainly would if they’d ever invested in the wrong one. An inefficient rod can be a nuisance, causing unnecessary leaks and issues with privacy, among other things. That’s why choosing the right one is so important and why we’ve compiled this list to narrow down the best shower curtain rod on the current market. When it appears to choose a feature for a functional space such as the kitchen or bathroom, there’s more to consider than simple eye appeal. In these rooms, form and function are equally important. Our product review and guide will fill you in on the pros and cons of each model, detailing specifics such as which is the best shower curtain rod for tile, which is the best for small spaces, and so on. 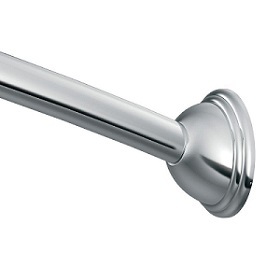 The muted brushed-nickel shades of this attractively curved rod would be a good fit for most decorating styles. Measuring in at a generous 58 inches long, it can easily surround a five-foot bathtub area. The curved design will help keep the shower curtain from encroaching on the tub space when in use. The rod itself is smooth, so there’s nothing for the curtain rings to get caught on. Moen offers a lifetime satisfaction guarantee on this product. 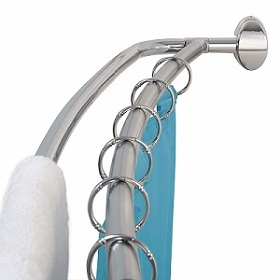 If you’re looking for a curved shower curtain rod, Moen delivers in just about every category. This unit is appealing, functional, and rust-resistant. Note that if you’re going to be installing this rod on tile, you’ll need a 1/4″ masonry drill bit. The rest of the requisite hardware is included. As the name indicates, this is a tension rod, meaning that it uses tensile strength (rather than hooks and other hardware) to cling to the walls. 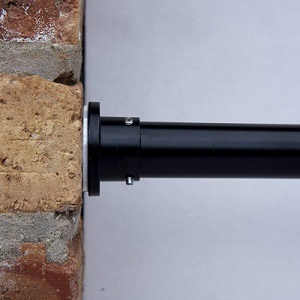 Clear rubber end grips help keep the rod in place, while also protecting your walls. This particular unit will stretch from 80 to 120 inches, so its uses extend beyond the bathroom it can be also used to hang room dividers in any area of the house. 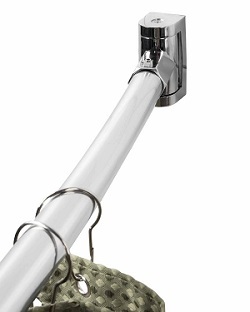 The rod is silver in color and runs smoothly for its entire length, like the Moen model. Consumers should note that while this rod certainly has enough strength to hold up a shower curtain, it’s a bit long for all but the most spacious bathrooms. We appreciate the ease of installation that comes with a tension rod, though. First-timers looking for a versatile model would do well to put this one on their short list. Wholesale Plumbing’s entry in the race features “Snap-Fit” technology for ease of installation, though it’s still a job best undertaken by two people at once. The rod stretches from 60 to 72 inches and measures just one inch in diameter. The curved design adds about six inches of space to your shower, depending on where it’s installed. The smooth satin nickel finish has a modern appeal but isn’t too flashy for older styles of decor. 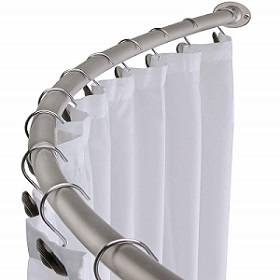 We’re big fans of the roominess this curtain rod adds to the shower, but there are a few drawbacks to be aware of. First of all, it’s important that the shower curtain and liner be equipped with rings that fully close hooks are likely to slip off the smooth surface. Moreover, the nickel finish is prone to chipping and peeling, even when it’s only been in place for a short time. Finally, be aware that while the “Snap-Fit” technology makes installation easier, it’s still bound to take longer than installing a tension rod. This aluminum rod is double-curved, meaning that it’s actually two rods: One can be used for the shower curtain itself, while the other can either keep the liner separate or do double duty as a towel rack. While Zenna claims that consumers will get an additional 12 inches of shower space with this curved design, this number is unlikely, as it’s necessary to install the rod at least two inches inside the shower facility to prevent flooding. The rod stretches from 45 to 72 inches and is smooth throughout its entire length. The aforementioned flooding can be a serious issue with the Zenna rod, so if you opt to invest in this model, take care to install it properly. Note that you’ll need two people for that job it’s too tricky to undergo the process alone. Some of the hardware is a bit flimsy, but the rod itself is fairly light, so this isn’t a major problem. This is another tension rod, but shorter than the offering from InterDesign it ranges in size from 43 to 75 inches. 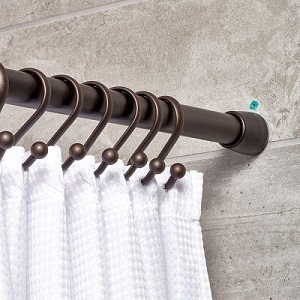 The coated non-slip end caps and the rust-resistant steel material make this the best shower curtain rod for tile of all the models listed here. Despite its narrow appearance, the rod is very sturdy, capable of holding both a curtain and a liner. The bronze finish would work best in bathrooms decorated in dark colors. This rod is exceptionally easy to install, and the broad range in length gives it versatility as well as style. There are no performance issues to speak of, either. If you prefer a tension rod but are working with a smaller space, this model could be just what you’re looking for. While this rod is installed on brackets rather than tension-mounted, the job is still easy enough for one person to handle on their own. The ends snap easily into place once the brackets are in position. 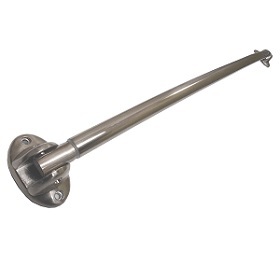 The sturdy rod measures between 40 and 72 inches and features a brushed nickel finish. Unfortunately, the easy installation doesn’t win this model quite enough points to recommend it. The finish is prone to rust issues, and not just on the rod itself the shower curtain and liner are often affected as well. If you’re looking for a curved rod, the entries from Wholesale Plumbing and Zenna both get higher marks. With a range of 36 to 61 inches, this rod is one of the shortest on our list. That isn’t necessarily a drawback this unit would be ideal in a stall shower or other small bathroom, and its curved design will make space appear roomier from the inside. The construction is aluminum, with a sleek chrome finish. Installation is a snap, and it comes at a relatively low price point. Don’t let the diminished size frighten you off, either; the rod is actually quite sturdy, capable of holding both curtain and liner, with a wet bath towel thrown on to boot. While this rod would work well in smaller spaces, it shouldn’t be written off for larger bathrooms, either. As mentioned above, it’s strong enough to hold a full-sized shower curtain and liner. We especially like the design of the solid mounting brackets. In case you’re still wondering what to look for when shopping for the best shower curtain rod, here’s a primer. Be forewarned that the right model need not contain all of these specifications; personal preference and other considerations such as bathroom size and decor should be taken into account as well. For obvious reasons, a shower curtain rod won’t suit your needs if it’s either too long or too short to fit in your shower. Fortunately, as you’ll learn by reading our Product Review Guide, most of them can be adjusted to fit a range of sizes. You’ll want to look for a sturdy construction with a material that resists rust formation, like aluminum or steel. While plastic doesn’t rust, it’s often too flimsy to get the job done on its own. If there are plastic components to the rod, they should be kept to a minimum. Nobody wants to spend an entire afternoon wrestling with their shower curtain rod. The good news? The majority of the rods on our list can be installed in a matter of minutes, especially if there are two people involved. It’s easy to tell when a manufacturer has confidence in their product they back up their guarantee with a consumer warranty. Check the packaging to find out what’s offered, or ask the retailer directly. 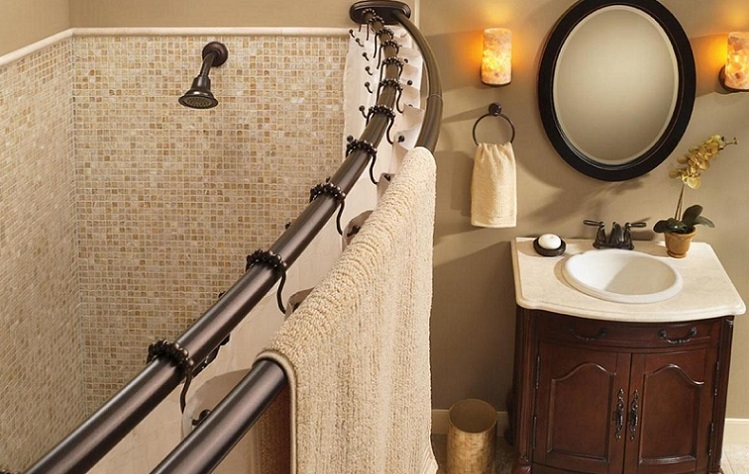 Here are some of the issues that arise most frequently when it comes to shower curtain rods. Q: Are tension rods better than bracket mounted ones? Ans: Generally, no, but the reverse isn’t necessarily true either. Tension mounted rods are easy to install, as they don’t require drilling or additional hardware. However, some of the lower-quality ones tend to slip during use, especially if they’re also used as drying racks. Consider a tension rod if you’re not particularly handy, or if you have a tiled shower that you don’t want to risk damaging with hardware installation. Q: How do you adjust the length on a shower curtain rod? Ans: The rod will usually contain a telescoping component for size adjustment. Tension mounted rods can be adjusted by turning the ends as you would a screw or a bottle cap. Check the owner’s manual to find out exactly how yours works. Q: What’s the point of a curved shower curtain rod? Ans: These models are meant to give you more elbow room in the shower and to keep the curtain from sticking to the sides of the tub or to you. Note that while they expand the shower space, they can make small bathrooms appear even smaller by encroaching on the footprint, so choose wisely. Q: What dimensions should I use to determine where the rod should be installed? Ans: Use your shower curtain to determine the length. The bottom of the curtain should rest approximately six inches below the rim of the tub. For steam showers, make sure the curtain hangs no more than an inch or so off the floor, to prevent flooding. Q: How will I know whether it’s safe to drill into the wall in the right place? Ans: Before drilling into any wall, it’s best to use a stud finder to make sure that you’ll be able to install the hardware safely. Note that if you’re a renter, you should be sure to get your landlord’s approval before undertaking any product that involves putting holes in the walls. Now that you’ve learned a little bit more about how to select the best shower curtain rod for your individual needs, you’re ready to start shopping. In case you still need a nudge in the right direction, here’s the unit that we deemed the best overall interDesign Cameo Constant Tension Shower Curtain Rod (based on the criteria listed in our Buyer’s Guide). While there are many models on our list worth considering, this one had enough useful attributes and few enough deterrents to win it the top spot. It’s attractive, rust-resistant, easy to install, versatile, and sturdy. Whether you’re installing on plaster, linoleum, or tile, the non-stick end caps will help keep this model in place throughout years of repeated use.